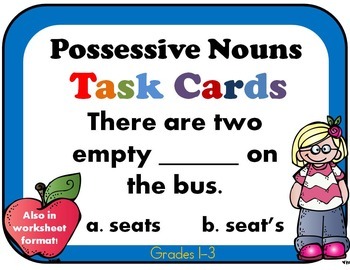 IDENTIFY PLURAL, SINGULAR POSSESSIVE NOUNS AND PLURAL POSSESSIVE NOUNS. Task cards are a fun way to review, practice, and assess skills! There are a variety of ways to use them, such as small groups, in centers and as a whole group activities. For fast finishers, morning work and so much more! I've also put the task card questions in a "worksheet" format, which can be used for homework or for assessments. Use one or both formats according to your needs!